Seventy years ago a new kind of company was created: a company specializing in visual communications. Leonard Crane Rennie, who founded Design and Production Incorporated in 1949, recognized that the US at mid century was modern, media-focused, and global. Drawing on his experience as a graphic designer, Rennie sensed a market for three-dimensional, informational displays. 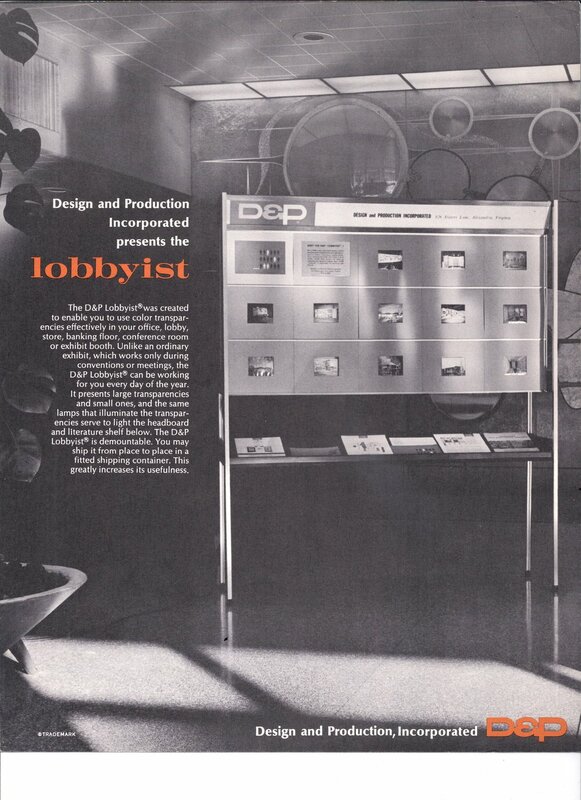 Design and Production Incorporated began in 1949 as a division of Industrial Displays, a New York exhibit fabricator. Rennie convinced Industrial Displays to form the new division near Washington, DC as a satellite office to capture a share of the increasing government demand for exhibit services. Rennie recognized the business opportunity based on his own experience as a government employee. He joined the government as a graphic designer during the New Deal and went on to work in the State Department’s Presentation Division, which created exhibits to promote America’s interests abroad. Before the Internet and PowerPoint, the government communicated information about its programs using three dimensional displays. Three-dimensional structures proved more engaging for clients and audiences than flat panels and posters. The Allied victory in World War II, spread of democratic governments, the escalating Cold War, and the post-war economic boom led museums, the government, and retail companies increasingly toward using exhibits as communication tools. Rennie purchased the division from Industrial Displays in 1952, creating an independent company. It had grown to 15 employees, including designers and production staff. Rennie chose the name “Design and Production Inc.” because it encapsulated the Company’s mission. D&P’s location near Washington, DC led to contracts with the Atomic Energy Commission, the Department of Agriculture, and the National Park Service. D&P designed and produced traveling small traveling exhibits for these agencies as well as private companies and trade associations. Demand increased through the early 1960s, especially as the portable exhibits became more interactive. D&P developed electrical components, such as lighting sets, that could be purchased as exhibit options. Spring boarding from the electrical work, D&P created increasingly sophisticated exhibits, including early interactive push-button displays for clients like the National Association of Home Builders and the U.S. Marine Corps. In 1955, D&P established one of the first electronics divisions in a fabrication house. D&P Electronics was promoted as an independent entity to develop and produce electro-mechanical devises for training purposes and displays. D&P’s Technology Systems Group continues as an industry leader developing and integrating multiple platform computer systems. By the mid-1960s, D&P had grown to 50 employees. The Company enjoyed early successes with producing portable informational exhibits. It developed a profitable line of temporary display structures for offices and lobbies. The graphic design team branched into producing posters, brochures, books, and even corporate annual reports. Soon, museums would begin to ask D&P’s assistance in producing exhibits.